About a year ago I was struggling to keep my focus during adoration and honestly that is something I continue to battle; however, thanks to fellow Council of Man member Mike Hans I have been able to use this book he recommended to help me reorient my thoughts during adoration. I think if we are speaking candidly about books we know there are books you read and keep, other books that you may not finish and furthermore books that you read and pass along to a friend or donate. I am not normally a betting person, as the sports teams I follow seem to provide enough suspense for me that putting money on the game is not necessary, but if I were to bet I would wager this is a book most people would keep. I know for me this book is a staple on the coffee table and is always in close range to guide me on my walk with Christ. The nuts and bolts of this selection of stories entail 27 short, easy to read, meditations on the Holy Eucharist. The meditations are about 3-5 pages in length and are absolutely beautiful in their devotion to Jesus. This is not a book that one has to read in chronological order rather it lends itself for the reader to decide which chapter to peruse. Some of the chapter titles include Christ Present in the Eucharist, The Eucharist, the Food of the Soul, Spiritual Disposition for Communion part 1 and part 2, Thanksgiving and The Holy Sacrifice of the Mass. 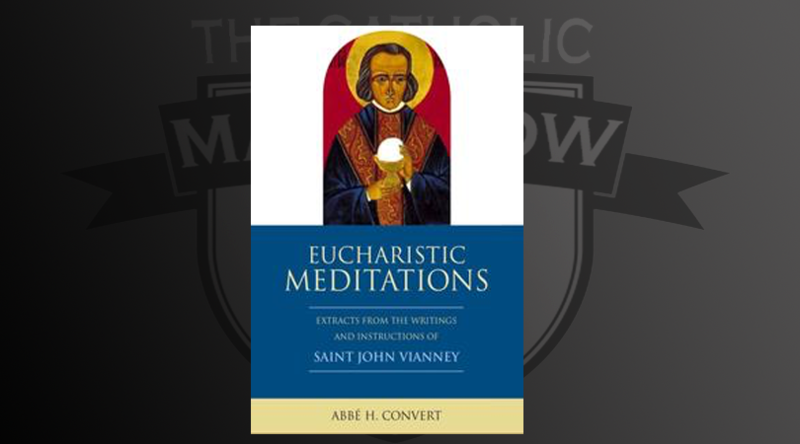 This book is a deeply rich compilation of the thoughts of St. John Vianney regarding the Eucharist and is a treasure trove of knowledge that draws readers to a higher level of connection with the gift of the Eucharist. Do you struggle going to adoration or find it hard to stay focused during adoration? Do you want suggestions on how to behave reverently after receiving our Lord in communion? Does the mystery of the Eucharist intrigue you? If you answered yes to any of these questions then this book is a must-read. Consider this book as part of your spiritual tool chest. Our daily lives can become easily distorted and out of focus. The world is full of distractions, temptations and pitfalls, but in the midst of all of those snares the truth and presence of Christ remains. Sometimes we need a nudge and some inspiration to bring order and light into our life. Consider this book as a guide and a gift pointing us back to Jesus and who better to draw us closer to our Father in Heaven than the patron saint of priests St. John Vianney. P.S. For extra information regarding St. John Vianney I am fairly certain The Catholic Man Show has an interview with Father Brian O’Brien which discusses this holy saint.